No smoke and mirrors, just the #1 performance in laboratory crash testing and actual race crash results. Serious head and neck injuries happen at impact speeds as low as 35mph. On short tracks with tight turns it is easy to be "Q-balled" almost straight into the wall. Don't put your safety at risk. 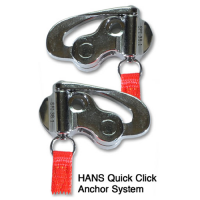 New sliding tethers available on all HANS Devices allow full vision on a tight track. There is a HANS Device model that is perfect for any driver and budget, the only difference is weight - all HANS Devices offer the same exceptional level of protection. The HANS Adjustable, which meets the SFI Foundations Spec. 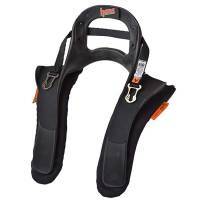 38.1 for head and neck restraints, enables all drivers to purchase a HANS with full confidence of a comfortable fit no matter what type of car or racing seat they use. It is adjustable in five-degree increments which allows the Hans Adjustable device to improve the fit and comfort for all racers. Pit Stop USA is the Online Motorsports Superstore! With the 2012 SFI 38.1 mandates in effect, the Simpson Hybrid Head and Neck Restraints are the only choice for racing protection. 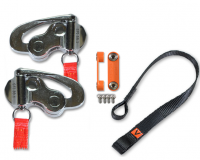 Designed for easily exiting the car without the danger of getting hung up on other gear, Simpson Hybrid Head and Neck Restraints also offer the lowest profile and highest level of multiple angle impact protection of any competing device. HANS Device Sport III: The New HANS III represents the third generation of injection molded HANS devices and features a contemporary approach to reducing weight. Using an all new design and polymer, the device features a hollow collar that substantially minimizes weight. Engineered reinforcements ensure an exceptionally strong structure that provides the same level of safety as every HANS device. The reduced mass guarantees the lightest and most comfortable injection molded HANS ever. 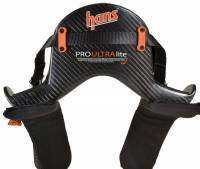 HANS Device Pro Adjustable: The HANS Adjustable enables all drivers to a comfortable fit no matter what type of car or racing seat they use. It is adjustable in five-degree increments which allows the Hans Adjustable device to improve the fit and comfort for all racers. 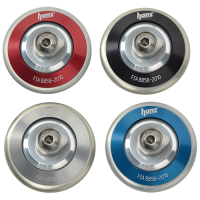 The HANS Adjustable can be used in different types of cars. If a racer competes in a sprint car with an upright seat and also a stock car with a reclined seat the device easily adjusts to the seat layback from 10 to 40 degrees. 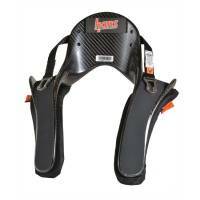 The HANS Adjustable Device has a low profile rounded back similar to HANS Device Sport II to improve entry and exit of the race car. 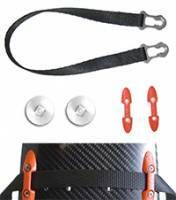 The HANS Device Adjustable is available with post anchor or quick click helmet anchors. The HANS Adjustable is an excellent choice for the driver who competes in several different types of motorsports and needs maximum flexibility in his head and neck restraint design. 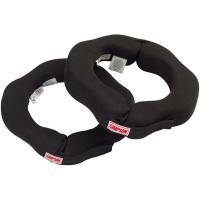 Impact Accel: The Impact Accel Head and Neck Restraint is scheduled for release in fall 2014. Similar in design to the Impact NecksGen, the Impact Accel is designed with angular impact protection, comfort, and affordability in mind. 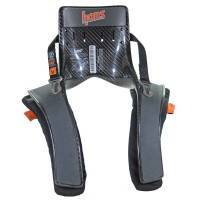 The Impact Accel promises to be lightweight and features unique body forming shoulder pads minimizing the pressure points on the collarbones. Designed with a single adjustable lateral helmet tether, the Impact Accel unit provides and alternate load path for superior side impact protection. We feature Simpson Hybrid Device at low everyday prices!